The cherry laurel is an adaptable evergreen that thrives in most soil environments. This hardy tree can reach mature heights up to 40 feet with a naturally oval, densely foliated crown. The cherry laurel adjusts well to pruning and is often used as a privacy hedge. 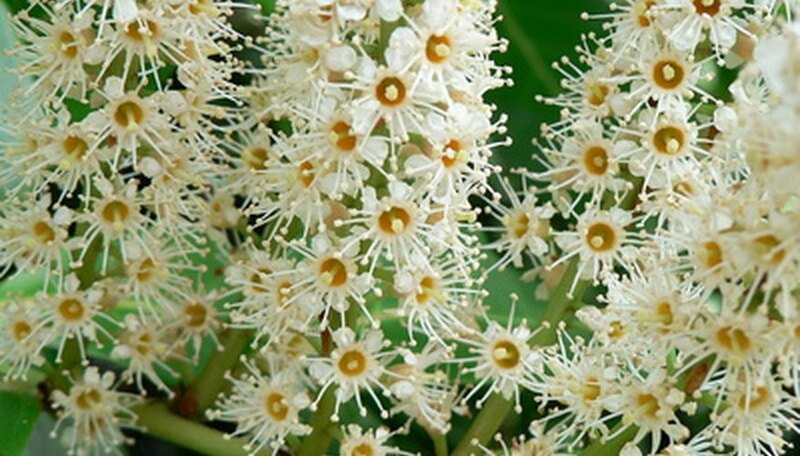 The fragrant and showy spring flowers, as well as the plentiful fruit, attract wildlife and insects, even though some parts of the tree are poisonous. Anthracnose is a fungal disease that infects the foliage, flowers and fruit of the cherry laurel. This fungal disease is commonly found on fallen debris that remains on the ground around the tree. During the spring months, the wind and rain carry the fungal spores onto the cherry laurel. The infected areas will develop small, dark spots. These spots coalesce into larger, deadened areas as the disease progresses. Infected cherry laurel trees will also experience premature defoliation, dieback of branches and stems and growth stunt. Severely infected trees will develop cankers around their twigs and branches. Infected areas should be pruned away with sharp, sterile pruning shears that are sterilized between each cut. Fungicidal treatments designed for anthracnose are effective in controlling and preventing this disease. Fire blight is a bacterial disease that causes the scorched appearance of the infected cherry laurel. During the windy, rainy periods of spring, this spore-borne disease travels from infected cankers onto newly developing shoots. Infected areas of the cherry laurel take on a discolored, water-soaked appearance that turns to a shriveled, darkened appearance, as if it had been scorched by fire. The deadened foliage and blossoms generally remain on the tree and can be surrounded by healthy, green foliage. Infected areas must be pruned from the tree. Fire blight can be controlled and prevented with a regime of bactericide treatments. Bacterial blight is a disease that can cause severe damage to the cherry laurel. Trees that are infected with this bacterial disease experience dieback of shoots and twigs, deadened buds, leaf spots and stem cankers. Though similar to fire blight, this disease does not cause the death of entire bushels of flowers and stems, rather a sporadic infection throughout. This bacterial disease infects the cherry laurel through its wounds and opening. The laurel is most prone to bacterial blight when it is weakened and stressed, caused by aspects such as winter injury, drought stress and nutrient deficiencies. Bacterial blight can be controlled with chemical treatments that are combined with a vigorous pruning regime.